This product is no longer available and has been replaced by: 31317. The 19533 surge protection kit is for radios with SMA antenna connectors, such as our cellular modems and RF450 spread-spectrum radios. It contains a PolyPhaser surge arrester (pn 14445), 18 in. coaxial cable, ground wire, and mounting hardware. It is typically used when antennas are mounted outdoors and/or are attached with a long coaxial cable. The outdoor antenna connects with the surge suppressor via the COAXNTN-L cable (purchased separately). The 19533 PolyPhaser is a dc blocking, general coverage arrester with Type N female connections on both sides. The kit's 18 in. coaxial cable attaches the radio to the equipment side of the surge protector. The cable is an LMR195 low-loss cable with a Type N male connector on one end and an SMA male connector on the other end. The surge suppressor attaches to an outdoor antenna via a COAXNTN-L cable (purchased separately). 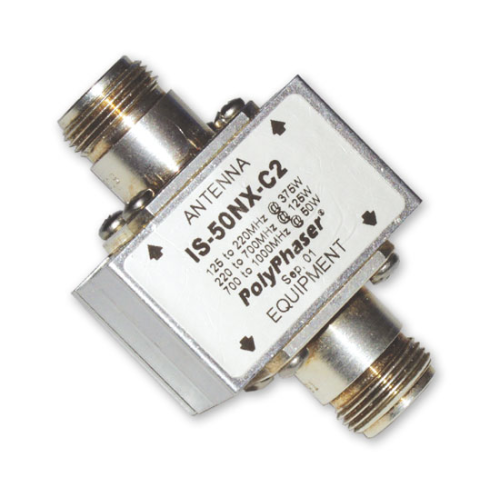 This kit is typically used to protect cellular modems and RF450 spread-spectrum radios from electrical transients conducted through the antenna cable. -NOTE- The 19533 Surge Suppressor Kit has components that have their own specifications. The 18 in. coaxial cable included in this kit is only compatible with radios with SMA antenna connectors. The surge protector is dc blocking and is, therefore, not compatible with products that use active antennas, such as those commonly found in GPS applications. More specifically, this kit is not compatible with the GPS antenna connections of the TX320, AL200, and LS300G.